Friday was quite the productive shopping spree for me. All drama aside, I got my virtual hands on some lovely HARE polish pre-orders! I'd been lemming these polishes for so long I was so happy to see the shop open again and can't wait to receive my polishes! So now I'm in the mood to celebrate with a fun and funky mani Recently The Nailsaurus posted a look that has been plaguing me since I saw it - the Sandy Skittle. To say it was exquisite would be an understatement. She took one color and put her spin on it in 5 different ways. I wanted to do the same but not necessarily in the same way so here's my translation using Essie's Action, a bright orange jelly polish released for their Poppy Razzi Neon Collection. 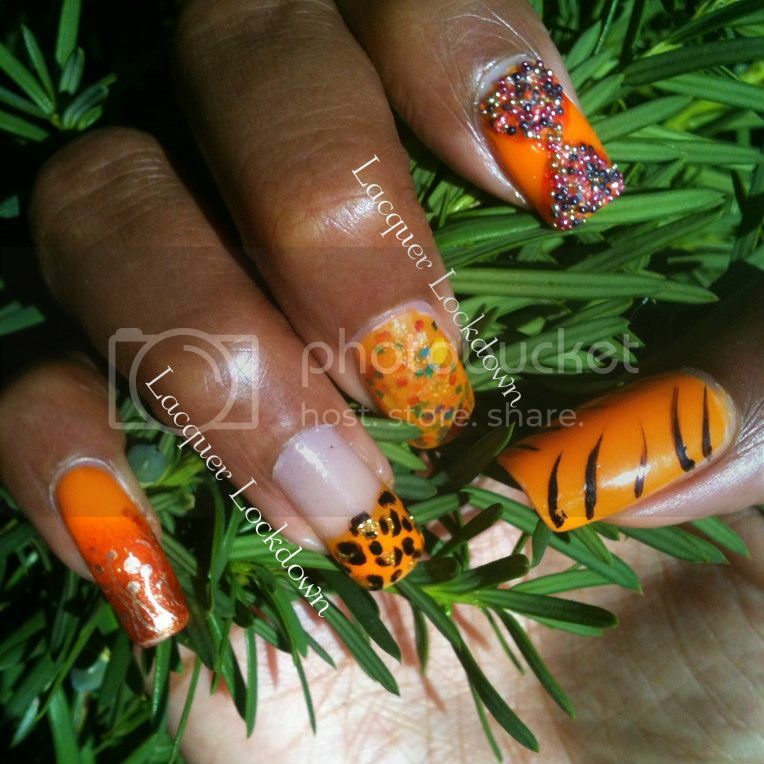 Thumb - Tiger print freehanded with Kiss Nail Art Striper in Black. Index - Microbeads of multicolors. Middle - Jelly sandwich comprised of two alternating layers of each polish using Lush Lacquer's Lite Brite and topped with Essie's Matte About You. 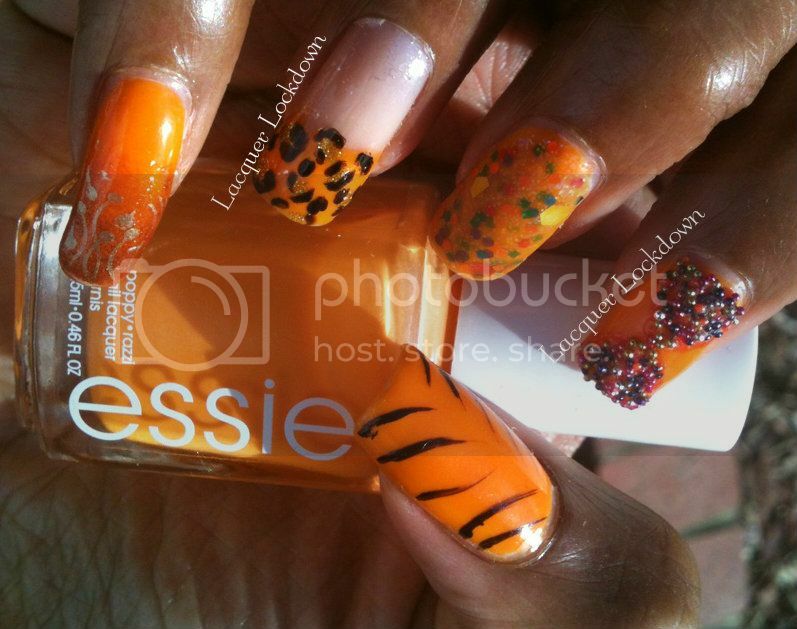 Ring - Leopard print french tip freehanded with Orly Liquid Vinyl and Kiss Nail Art Gold Glitter. CND Effects Gold Shimmer is also over the base coat. Can you say jelly? Lol! 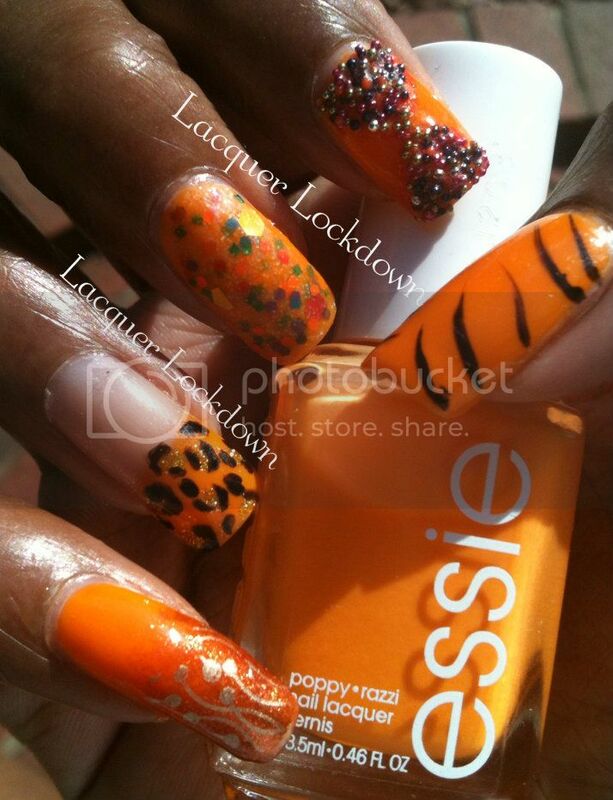 I haven't been this impressed with a neon orange polish since Color Club's Wham Pow! Isn't the mattified sandwich here so juicy looking? 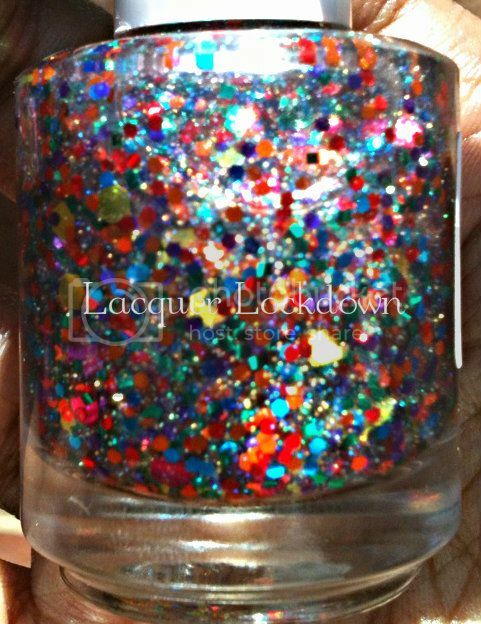 The more I look at Action the more I realize I need absolutely every color from the Poppy Razz Collection. I'm only missing Bazooka so game on! The microbeading on this gave me so much trouble. It's my first time using them in this manner but jeez it was quite a bit of work to get them placed properly. This is definitely funky and not for the faint of heart! 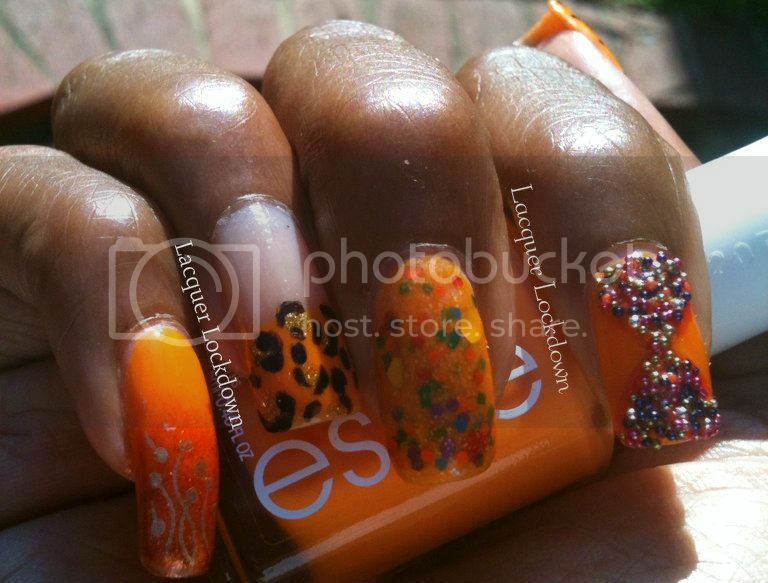 My favorite nail is the matte jelly sandwich closely followed by the glitter leopard. This was fun albeit time consuming. The final result is so upbeat this would be perfect for a night out. What do you ladies think? 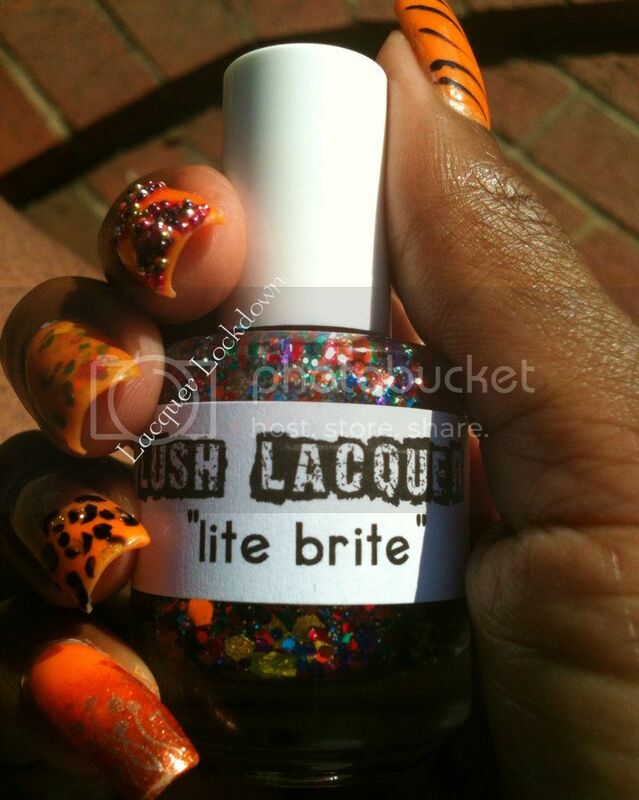 If you are interested in Lite Brite and other amazing glitterbombs find you can find Lush Lacquer on Etsy. Song stuck in my head today: Nighttiming by Coconut Records. All about cheating hearts minus the angst - lol. Anyhoo, thanks for reading and toodles! Thank you doll! I'm having a hard time taking it off myself! I fell in love slowly. Thank you hun! I agree Essie really outdid themselves this time! I love this! The glitter sandwich is my favourite- it made a really interesting effect. Fun mani! Thank you sweets! Yeah I thought it was strange to see what happened to the glitter beneath the polish. I was really surprised to see the color held true. I might have to try this effect again sometime soon.